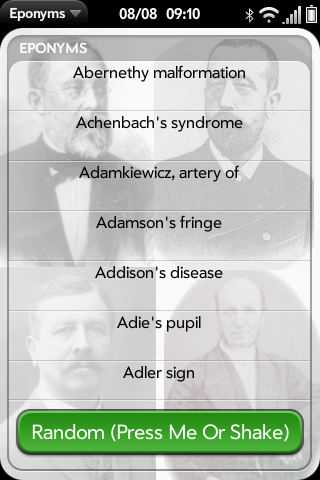 Over 1,700 common and obscure medical eponyms (e.g., Rovsing's sign, Virchow's node) with descriptions in your WebOS device! This program is a port of the Eponyms database by Dr. Andrew Yee (with permission) specially formatted for WebOS. Visit the original Eponyms project page http://eponyms.net for more information. Eponyms for WebOS additionally allows you to search the Whonamedit.com and Wikipedia sites for more information. There is a handy search button for every Eponym in the database which takes you to this search page (which in turn can also be accessed from the Menu for individual custom searches). v 1.7.9 Changed background color to a lighter yellow. v 1.8.0 Added a Random Eponym button. v. 1.8.1 Changed the AppID to differentiate it from the one in the App Catalog. v 1.9.8 Added Ability to fetch a Random eponym either by a button press or shaking. v 2.0.0 Bug and UI fixes. Search count now shows on list filter. Font size of WhoNamedIt search result optimised for portrait view.